Subsistence hunting occurs throughout Alaska all year long and is central to the customs and traditions of many cultural groups in Alaska. For most rural Alaska Residents, subsistence hunting is critical to their nutrition, food security, and economic stability. In many rural areas, subsistence hunting, similiarly to subsistence fishing, is considered as a part of normal routine of work. Depending on the community and area, moose, caribou, deer, bears, Dall sheep, mountain goats, and beavers are commonly used land mammals. Seals, sea lions, walruses, and whales make up the marine mammal harvest. 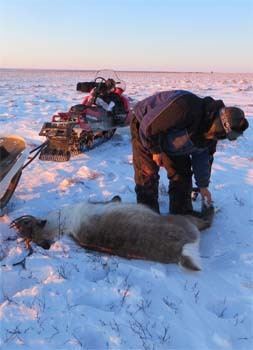 Subsistence hunting in Alaska is normally managed under the same regulations as general season, drawing, and registration hunts, and a hunting license and harvest tag is usually required. Waterfowl are jointly managed by the state and federal governments and a caucus representing eligible Alaska Native tribes. A state hunting license and state waterfowl stamp are required to subsistence hunt waterfowl. Subsistence hunting for marine mammals is managed by the National Marine Fisheries Service (seals, sea lions, whales) and the U.S. Fish and Wildlife Service (sea otters, polar bears, walrus).